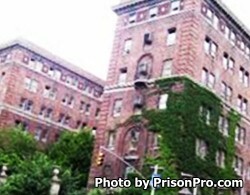 Bellevue Hospital Prison Ward is located in New York, New York. It treats inmates who have become injured or ill, or who require psychiatric care. Only male inmates are treated at this facility. The ward is located within a secure area of Bellevue Hospital.